The ECV1 (Experimental Composite Vehicle) was a composite technology concept car testing the use of carbon, kevlar, thermosetting and thermoplastic resins, glassfibre and honeycomb in car production. It was considered Lancia’s prototype Group S car. The ECV1 was considered Lancia’s prototype Group S car. In essence, it was a further development of the S4, featuring the same basic design but incorporating huge technological strides, with many of the components now made from composites, including the main, load-bearing section of the body. The ECV1 was powered by a 1759cc twin turbo (dual KKK units) engine producing 600bhp at 8,000 rpm, using a brand-new design known as ‘Triflux’, where the two turbochargers were used sequentially depending on the engine speed. By the time the ECV1, dressed in Martini factory livery, was revealed at the 1986 Bologna Motor Show, it was already a dinosaur, consigned to the pages of history before even turning a wheel. Almost a quarter of a century after its creation, the Lancia ECV1, which shattered even the huge technological advances being made right at the climax of the Group B era, will finally make its rallying debut over the weekend during Rally Legend 2010 in San Marino. By the time the ECV1, dressed in Martini factory livery, was revealed at the 1986 Bologna Motor Show, it was already a dinosaur, consigned to the pages of history before even turning a wheel. The era of the Group B cars was set to come to a close at the end of that year, and the category’s demise also marked the end of its planned replacement, Group S, for which the ECV1 had been developed. Instead, the sport took a new direction from the beginning of 1987, with the production-based Group A becoming the premier category in world rallying. The Group B machines ruled the roost on the rally tracks for just a handful of years in the early-to-mid 1980s, but they tore up the form book, and brought with them a raft of technological advancements. While the homologation run for Group B was 200 units, the expense of building that number of high-tech cars saw a new formula proposed. This new category, Group S, mandated the building of just 20 units, allowing manufacturers to concentrate vast sums of money on a mere handful of cars. By early 1986, however, the Group B cars – ‘Killer Bs’ – had simply become too fast and too powerful for the world’s rally tracks to cope with, and the Group B chapter, the greatest era that rallying has ever known, came to an abrupt end. 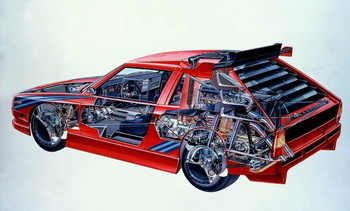 While Lancia’s dramatic Delta S4 had fought the factory Peugeot and Audi challenge in the WRC in 1986, its engineers in Turin were also busy working on the future Group S framework. 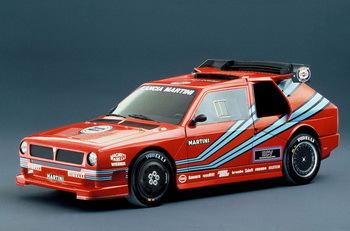 The Delta S4 was already a wild beast, so powerful and terrifying that only the legendary Henri Toivonen and Markku Alen, the latter of whom only missed out on that year’s driver’s title in a Paris court room, were ever regarded as ‘taming’ its ways. However, if the FIA hadn’t called time on the duelling Group B titans, there is little doubt the S4 would have been eclipsed as the most fearsome rally car ever built by the ECV1. The ECV1 (Experimental Composite Vehicle) was a composite technology concept car testing the use of carbon, kevlar, thermosetting and thermoplastic resins, glassfibre and honeycomb in car production. It was considered Lancia’s prototype Group S car. In essence, it was a further development of the S4, featuring the same basic design but incorporating huge technological strides, with many of the components now made from composites, including the main, load-bearing section of the body. Other composite parts included the wheels (8x16” in asphalt trim, but weighing only 6kg) and the propshaft. 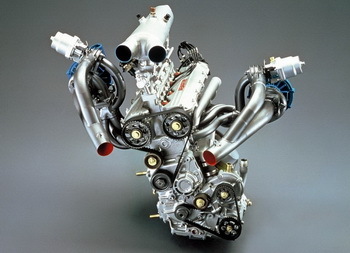 It was powered by a 1759cc twin turbo (dual KKK units) engine producing 600bhp at 8,000 rpm, using a brand-new design known as ‘Triflux’, where the two turbochargers were used sequentially depending on the engine speed. An overall weight of 930kg was achieved. However, the ECV1 was to never turn a (composite) wheel in anger. Until now, a quarter of a century later. 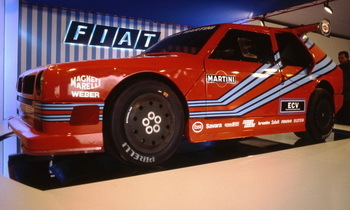 Consigned to the Lancia museum as the Group A era kicked off in 1987, it was forgotten by time. Meanwhile Lancia kept bringing home victory after victory as it dominated the early years of Group A, continuing to build up the legend that helps form the mystique of the brand today by beating all comers on the rally tracks. But now, the ECV1 will get its first-ever outing, and it will be in the hands another of Lancia’s rally legends, Miki Biasion, a driver who was integral to Lancia’s success in Group A and who took two world titles at the wheel of the Delta integrale. He is “excited and impatient” to give the ECV1 its long-awaited debut, a day that rally fans thought would never arrive. Biasion and the ECV1 will be in very good company in the Republic of San Marino at the weekend, as the list of top names present at Rally Legend 2010 is getting longer by the day – it currently nudges the 200 mark. And rightfully, according to rallying history, Lancia will steal the show. The line-up of Turinese winners will include Uruguayan driver Gustavo Trelles, a former world production champion, in a Group A Delta, as well as a driver who has entered Lancia rallying folklore, Sandro Munari, at the wheel of the amazing Stratos, winner of three consecutive rally titles in the 1970s. Also in a Delta HF will be Alex Fiorio, who campaigned the little hatchback on the world stage in the colours of the Italian national lottery, ‘Totip’, for the satellite Jolly Club team. But it is not just Alex – his father, Cesare Fiorio, the mastermind behind Lancia’s rally success and regarded by many as the greatest team manager the sport has ever seen, will also be in attendance. Another confirmed presence is Dino Maggioni, the CEO of the Fiat Group’s Magneti Marelli division, who will co-drive Luca Pedersoli in a Delta to be run by the Italian Astra Team. Sergio Limone and Claudio Lombardi, gifted engineers whose skilled hands created the breed of rally-winning Lancias will recall their experiences, as will Rino Buschiazzo, the legendary crew chief of that near-unbeatable official Lancia team of the 1980s and 1990s. Other famous names from the past set to take part on the asphalt stages include Francois Delecour and Fabrizio Tabaton (Peugeot 206 WRC), Didier Auriol and Juha Kankkunen, who will reunite with their Toyota Celicas, Walter Rohrl in the immortal Group B Audi Quattro S1, and Federico Ormezzano in a Talbot Sunbeam Lotus, while ex-F1 driver Sandro Nannini is also slated to join the action. Anther racer on the stages will be Jacky Ickx, who will pilot the ‘eco racing’ VW Scirocco R Bio that Carlos Sainz drove on its debut on the WRC’s Rally of Germany. The start of the 8th Rally Legend 2010 will take place on Friday, October 8, at 7.30pm, with finish scheduled near midnight. Two special stages, to be repeated twice, form the core of the action. On Saturday, October 9, the start of Leg 2 is slated for 11.30am, with the arrival at the finish being set for around 6.45om. Among the special stages scheduled, there is a new one which has never been run, at nine kilometers in length. At 9.00pm on Saturday night there will be a gala dinner and final prize-giving ceremony at the Palace Hotel in San Marino. As for the real race, Rally Legend 2010 will have two different classifications. The first will be reserved for the ‘Legends’ (historical cars and expired homologation cars bunched together), without any handicapping but subdivided into classes. The other category will be for the ten ‘World Rally Cars’ that have been selected to take part. The Group B cars and the ECV1, although not fighting against the clock, will be grouped in the ‘Legend Stars’ category, a high-speed parade that will precede Rally Legend.